Oregon Desert Trail from Flatiron Trailhead to Sand Springs: Thoughts and Learnings on Section 1 – .douchepacker. Last year after doing a trip in the Oregon Badlands Wilderness, I set the goal to start section hiking the Oregon Desert Trail. On that trip, I completed a small portion from Tumulus Trailhead to Highway 20. I had big ambitions in 2016 for doing more of the ODT, but was stymied by daunting logistics, particularly the lack of water, and options for a loop. Without options for a loop or a shuttle, its kinda hard to pull it off. I think its actually better to thru-hike it if you have the time. I got lazy and just went to other places last year instead. Recently, I was reading another persons trip report on the ODT, and they combined a section of the ODT with their own cross country bushwhack and hitchhiking to complete a loop. I though this was brilliant, especially the hitchhiking part. Its not like you can hail a taxi out there. I planned to start at Hwy 20 at the Flatiron Trailhead and complete the portion of the ODT to Sand Springs. I cached 2 gallons of water and food on top of Pine Mountain the evening before starting the hike. Then my plan beyond Sand Springs was to hike NFS roads back up to Hwy 20, and hitchhiking if possible, but this is a pretty desolate area so I was prepared to slog it out. Once I reached Hwy 20, I planned to hitchhike back towards the Oregon Badlands where my car was. Here’s the planned route. The yellow is the ODT portion, the red part is the walk along NFS roads to get back to Hwy 20. The blue dotted line is the part I’m counting on for a hitch along hwy 20. This day I hiked up and around the back of Horse Ridge. On an off trail portion I heard a cougar screaming for the first time in my life. I then crossed the hot, flat, featureless Millican Valley. I camped right at the foot of Pine Mountain, saving the 2000 ft climb for the morning. 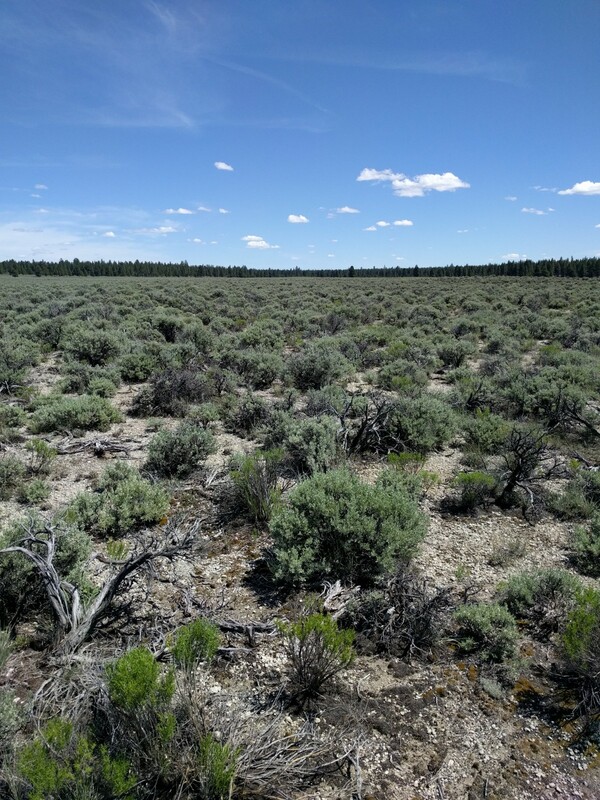 This day I hiked 2000 feet up Pine Mountain and picked up my water and food cache, rested a bit, and then descended down to the “Pumice Desert” as it is labelled on maps. After this it was pretty smooth all the way to Sand Springs, although I had to constantly drink water to stay hydrated. Water is crucial for this part of the ODT because it is so damn dry. It is also incredibly heavy. At the start of the trail I had 2 gallons of water in separate jugs and a .75 liter water bottle, putting my weight at around 36 pounds. I drank or cooked with every bit of that water over the course of the first day and the next morning until I reached my cache at the top of Pine Mountain. I cached another 2 gallons there thinking it would be dry all the way to Sand Springs. However, Antelope and Pumice Springs on the way still had water, albeit gross and full of huge tadpoles and algae. I was thankful to have to clean water to be honest. If you want to do this trail, use ONDA’s guide so you can stay safe. If you can, donate to ONDA, they’re doing a lot of good work out there and can use your support. As far as gear goes I was all about sun protection for this trip. I took my trusty straw hat, which is now shredded and in the compost bin. I also took sun gloves to protect my hands. Everything exposed was slathered in sunscreen. The temps were in the high 70’s but it felt a lot hotter with all that weight. Dirty Girl gaiters were crucial and worth every penny. Otherwise the sand and pumice would’ve ground my feet to shreds. The sandy and pumice soil can be terrible to hike through and I got several blisters, so bring good moleskine or some other way to care for your blisters. I cowboy camped, which I prefer in fair weather. However, in the morning everything was completely covered in dew, especially my quilt. It dried out pretty quick once that sun was out though. Really enjoyed your last two posts (reptiles!). The desert is my favorite part of Oregon and I miss it so it’s great to see pics and here your stories. The writing is good, hope you keep at it.